Thanks to John Romard at Boston Attitude for this beautiful shot! 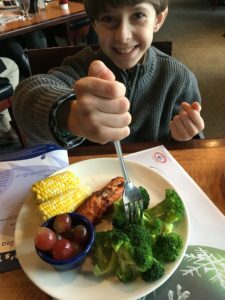 After TealKid was diagnosed with food allergies, life changed a lot in a very short amount of time. We knew he had some issues from pretty much the get-go. At 6 months, he would develop a rash ONLY when we were at my Mom’s. It was strange, but we didn’t put it all together until his diagnosis just after his first birthday. My Mom watched my niece, who was a preemie and had very bad reflux. Her carpets were covered in formula, so he was crawling through a field of contact exposure. When he was one, we tried eggs and experienced what we now now was his first anaphylactic reaction. Shortly after that, we tried eggs again (I know, smart, right?) Then, a week later, milk. Then it all clicked. We picked up a script for an epinephrineauto-injector that day, along with a referral to an allergist. And so it began. That time is now fuzzy at best. I feel like we crawled into a shell. We didn’t leave the house as much as we used to. Didn’t go to play dates. Our world felt a lot smaller then, because we were scared. When life is happy-go-lucky, and then you are diagnosed with an allergy, things slow down and much like anaphylactic shock—you funnel your energy to the core, and that was where we were safest. An asthma diagnosis came a little while later as well which is huge added stress and the most likely reason for days missed of school for kids. 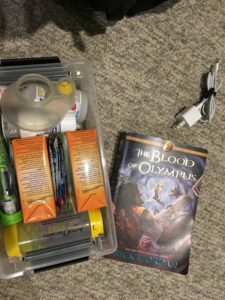 Extra epinephrine, Splash nutritional supplement, an Aero chamber for inhaled medications that are also in the box as well as a few pills and a good book, ready for take off! We are almost 9 years on here, and life has been a series of steps. Baby steps,others don’t make note of—a trip to the museum where you hawk-eye what the other toddlers are touching, going to the zoo or visiting a working farm. An overnight means packing the normal stuff AND the medication AND the food. Making sure there is enough food for ANY possibilities. Then comes school. More and more your confidence grows, but there’s always that underlying low-level stress. 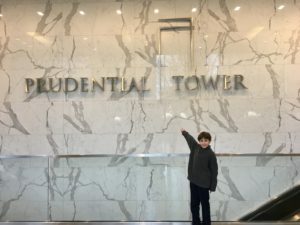 On Monday night, TealKid and I had the opportunity to head to his favorite city to visit, Boston, for the lighting of the Prudential Tower at the Prudential Center. Every year in December, they light the tower for different causes during their 31 Nights of Lights. We were fortunate enough to be chosen for the 5th day of the month. Most of our lightings happen in May, so this was an occasion we were able to get to, and they have a ceremony and everything. This sounded like a great opportunity to work with a lot of our friends in the Boston area, so I decided to go. After talking about it with my husband, we decided it would be a great opportunity to have TealKid go as well! 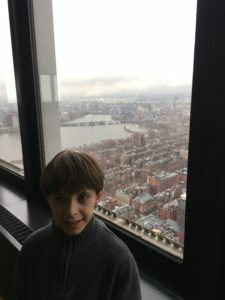 We have been there before to see Dr. Fasano at Mass General for his Celiac disease when we were having issues and it was great to be back in a place we knew would take care of him and that he loves so much. 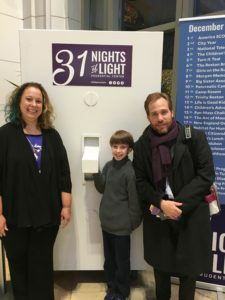 We flew JetBlue for the first time on this trip who interestingly enough was receiving an award that very night in New York City for their allergy policies from FARE and presented by Lianne Mandelbaum. I have to say, our experience was probably the easiest flight we have had (though to be fair, this was only our third flight). When I made the reservation, they noted our allergy needs, and we checked in when the gate opened. They offered to show us their snacks, and they let us know they were all nut-free. I thanked them for the offer, but as our list is on the longer side, I assured them we had enough with us. It was a short flight, so I didn’t think that would be an issue. He was also presented with a set of wings, which he proudly showed everyone he met throughout the day. They let us pre-board and I was able to wipe our row down. After everyone was seated, they discreetly mentioned to the adjacent rows that there was an allergy in the area (while still respecting his privacy), and offered to reseat anyone who had an issue with that. Everyone on both legs was kind and no one had an issue with the no-nut zone. On the way home, there was a moment of terror when the man across from us was eating Chex mix before they made the announcement. But as soon as they said it, he quickly grabbed the bag, looked at it, and closed it up. It was a moment of “OH MY GOSH,” but I overcame and I played it cool for TealKid’s sake. All was well. Once in Boston, we were sure to stop at his FAVORITE restaurant ever, Legal Seafood. The first thing he asked when I talked to him about going was “Can we go to Legal?” I contacted them as soon as I made our reservation, and they assured us they would be able to accommodate him with no problem. We got there closer to the lunch rush than I normally would, because we were delayed a few hours on our flight (which is why I packed all the snacks I did!) Our server Matthew was amazing, and when I had extra questions, he was quick to get the manager on duty to assist. They obviously did a great job, since I had to order a second portion of salmon. He felt like the King of the World! decorated for the holidays beautifully. We had some extra time and decided to go to the 50th floor observation deck. Anyone who knows me knows I HATE heights, but these are the things we do for our babies. I have to say that after we got up there, it was amazing and I’m so glad he wanted to go. I would have never done it on my own! It was on the foggy side, but it lifted enough for us to see a lot, and I would even be willing to go back up when we get back to Boston (which he hopes is very soon). After we made our way back down, we arrived at the staging area for the lighting. 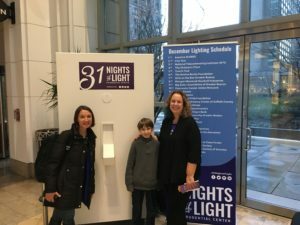 We were so excited to see the giant prop light switch, it was even more fun than I thought it was going to be! It was bigger than me and he just looked adorable next to it. 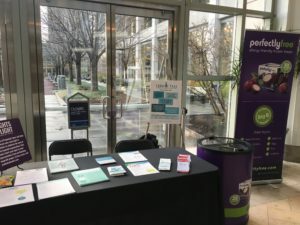 We had the opportunity to distribute information from amazing allergy groups like KFA, AAFA, Allergy Eats and FAACT. Our new friends from Perfectly Free were there to offer their support AND to hand out their tasty allergy-friendly snacks. So many of our allergy friends were able to make it to see us like 88 Acres, Rebecca’s Nut Free, Miss Allergic Reactor, Aralyte and many others. I was humbled beyond words to be able to meet Laurel Francoeurr of the Allergy Law Project and Dr. Shreffler from the Food Allergy Center at Mass General. It was a small area filled with allergy knowledge from so many different areas of experience, it was truly mind-blowing. 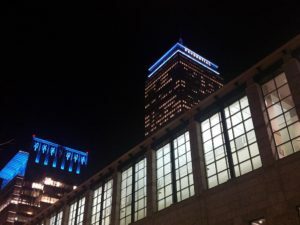 Promptly at 5:00, TealKid did the honors of lighting the Prudential Tower Teal. As an advocate, it was an amazing moment to literally shine a light on the growing epidemic and public health issue of food allergies. As a Mom, I could not have been more proud. He’s becoming quite the advocate, underneath th goofy little boy that started us on this journey almost 10 years ago. Once flipped the switch, we had a few moments to chat with our friends before we had to run back to the airport for an 8 PM flight home. I have to admit that I wasn’t even able to get my own pictures of the tower lit, because we didn’t have time to walk far enough from under its shadow to see. I thank all of you who have sent me your pictures. Then we were off, and got home 18 hours or so after we left. There were other stops along the way, and great times and wonderful memories. 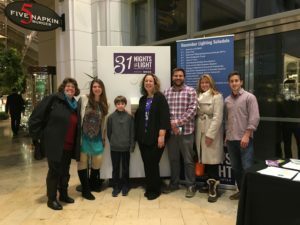 I am so grateful to my family who believes in me enough to have helped make this trip possible, and for the Prudential Center for helping us raise awareness during this wonderful event. At diagnosis 9 years ago, I wouldn’t leave the driveway without a minor panic attack. Now we are off to a different city for a day, and with preparation and a good plan, are able to manage an amazing experience. If you would like to have a building, monument or bridge in your area lit teal to promote allergy awareness please contact us with the name of a site and we will do our best to make it happen! We look into every suggestion we get! All opinions and experiences are my own. I am not paid or affiliated with any of these companies, other than working with them to bring more awareness to the issue of food allergies. Any products names are safe for our family, but you always must check for your own safety.